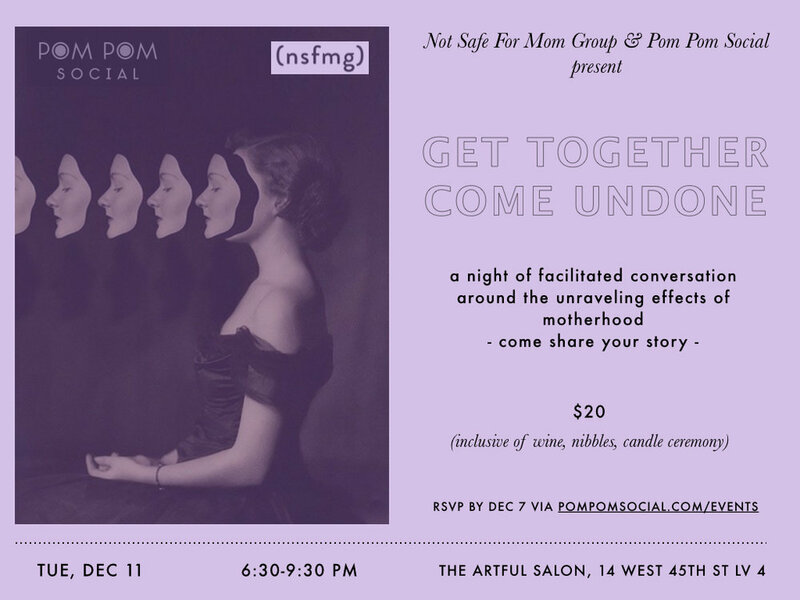 Pom Pom Social and Not Safe For Mom Group are excited to join mama forces for this special event — in our mutual belief and guiding vision that getting real and sharing stories builds community, and that being vulnerable together is where the magic happens. One example, story, thought, or feeling, around the idea of being unraveled, broken, pulled apart, undone, (even if only for a short time) etc. by your motherhood experience — wherever you are in your journey. We will gather and speak about these experiences in an intimate and inviting space. We will lightly guide you through activities and conversations that will help you tell your story, and ultimately, help you feel connected to the other women in attendance. A feeling of connection. A feeling of release. New friends. Nibbles + Wine provided by our friends Union Wine. Evening will conclude with a candle ceremony. NO BABIES THIS TIME - due to the limited space and nature of this event, we ask that no babies tag along for this event. Thanks for your understanding.